Hello everyone, Sorry that I haven’t posted in a while. I have been busy with a new path in life. 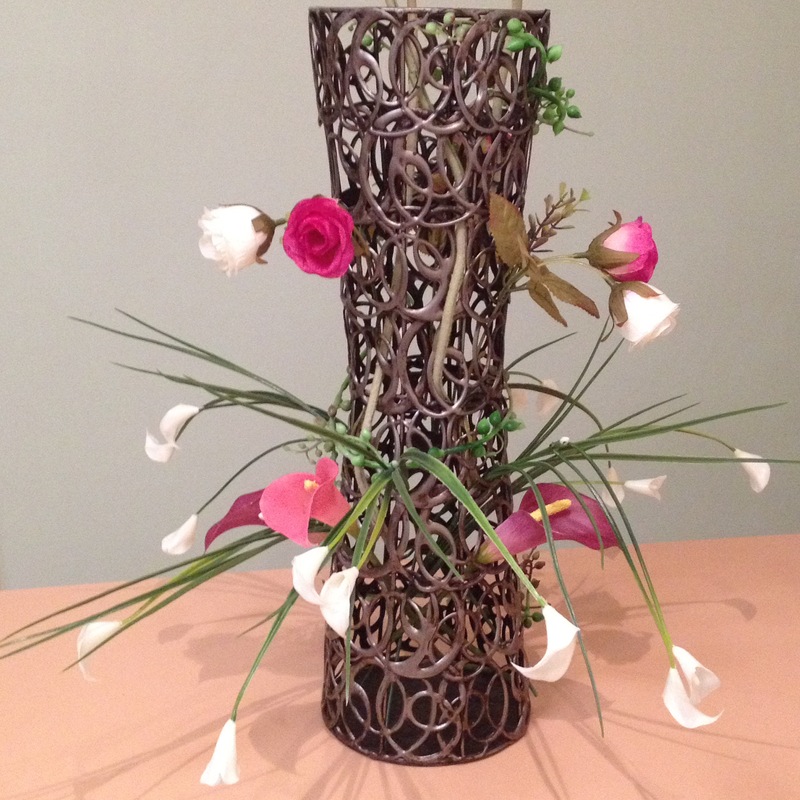 I have embarked on a creative journey into the world of Floral Design! I have always loved flowers and been creative, starting with a multimedia degree at uni and working in graphic design, enjoying photography, painting and hand crafting things. Now I have found a way to combine almost all my interests with my passion for Flowers! I call myself Zara’s Floral Decor and feel very excited to share with you here some of my most beautiful Floral Arrangements. 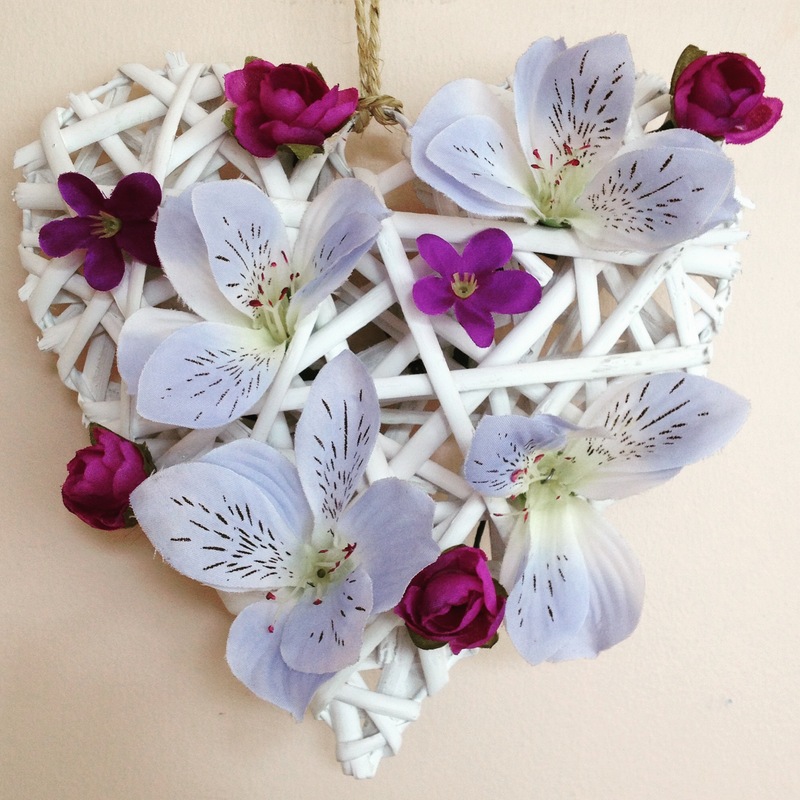 I create from the heart, using quality life-like artificial flowers. I believe that they are the best possible home decoration idea, the most thoughtful present and a long-term source of joy. Artificial flowers don’t wilt, they don’t require watering or cutting stems, there is no tears, when you have to throw your wilted flowers (money) away. What a perfect idea to keep your Wedding Bouquet forever and you can do it with faux flowers! Also they do no smell and therefore don’t cause allergy. 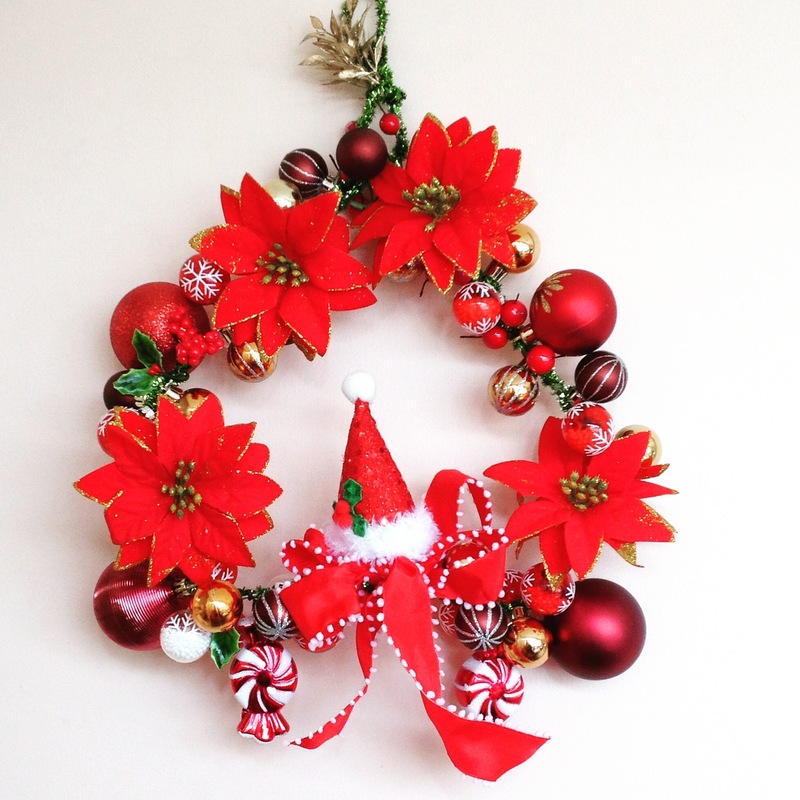 I hope you can give my floral creations a go and tell your friends and family about them! please Email: eflowerz@outlook.com I welcome any questions, comments, custom design requests. In Australia on 13th May we celebrate Mother’s day. Would your Mum like such a gift? I look forward to sharing more with you soon and hope you can take a few moments out of your busy lives to enjoy flowers! Today I’d like to introduce you to Naira, founder of creative stationery business, Graceful Avenue. She’s here to talk about her label’s monthly subscription box service called Mishka Mail, which started in August 2016 and will end with the July issue next month. So pour yourself a cup of tea and escape for a few minutes into the world of Graceful Avenue and Naira’s passion for all things stationery. Hi Naira! Please tell us about Mishka Mail. Mishka Mail began out of a yearning for me to push myself both creatively and professionally. It’s our monthly stationery subscription box, which delivers cute, illustrated paper creations to customers on a monthly basis and is a surprise right until you open the parcel! I wanted to create something that would be a great treat for a person to receive and over these past kits we’ve included everything from stickers, gift tags and wall prints right through to greeting cards, postcards and bookmarks. The world always needs more snail mail, right? It’s been such a joyful project and I’m certainly sad to see it reach its end but it’s the right thing to do for now. Perhaps in the future we could revive this idea, we’ll have to wait and see. How did the idea of Mishka Mail come about? Recently there’s been a real trend towards subscription boxes. We’ve seen them popping up here and there overseas with food, cosmetics and jewellery boxes being the most popular. Although this concept is still relatively new to Australia, I really wanted to see what launching a stationery subscription box would be like and have enjoyed every second of this chapter in Graceful Avenue’s colourful book. There’s a lot of work that goes into such a concept. There’s months of planning ahead and designing, coming up with themes and then taking care of the marketing side of it. I’m so pleased that we’ve come full circle with a subscription box for each month of the year. It’s been a lot of fun! What has been your favourite edition of Mishka Mail? I’ve loved creating each and every single edition of Mishka Mail this past year. If I had to choose, my favourite would probably be the not-yet-released July issue because of the Gratitude theme. We’ve got a massive edition out next month to show our fans how grateful we are for their support. There will be a lot of quirky paper goodies for everyone to enjoy and it’s going to be epic. What’s the story behind Graceful Avenue? I started the brand six years ago when I was a fresh university graduate with an Interior Design degree in my pocket and very slim job prospects. I wanted to do something creative and began illustrating and sewing pouches for sunglasses. I drew Mishka the panda for the first time when I was a shop owner in the UK from 2012-13 and haven’t stopped drawing him since! What does a day-in-the-life of a stationery label owner look like? I usually start my day by checking emails and packing orders in the morning. After breakfast and a quick dash to the post office, it’s back to the studio where you can find me planning future Mishka Mail kits, illustrating, taking photographs for social media and blogging. I usually go for a late afternoon walk and unwind with a cup of green mint tea in the evening. I feel so fortunate to have the freedom to mix it up on a daily basis. If I feel like staying in bed in the morning and replying to emails, I can do it. If I want to take a day off and do anything I like, I can. I love being my own boss so much! What are your plans for Graceful Avenue in the future? Well I certainly hope my label can continue to grow and gain more fans along the way. Our new Online Shop will continue to stay open with more and more products being added regularly. I hope to get creative with videos showing the design process I go through and give an insight into who the girl behind the brand is. I hope to collaborate with my fellow bloggers, continue to be inspired by my fellow illustrators and never stop the creative juices flowing. I’m excited about what the future has in store for us, that’s for sure. Yes, I’m pleased to announce that we’ll be hosting our second giveaway very soon where one lucky winner will receive the entire July Mishka Mail kit as the prize! If you’d like to follow us on social media with the handle @gracefulavenue you’ll be the first to hear about when we do this and how you can enter. Secondly, I’d like to thank everyone who has bought a Mishka Mail kit, reviewed it on their blog, hosted a giveaway with us, spread the love on social media and followed us over the years. I feel so blessed to be able to do what I love for a living and hope you continue to support my small business. 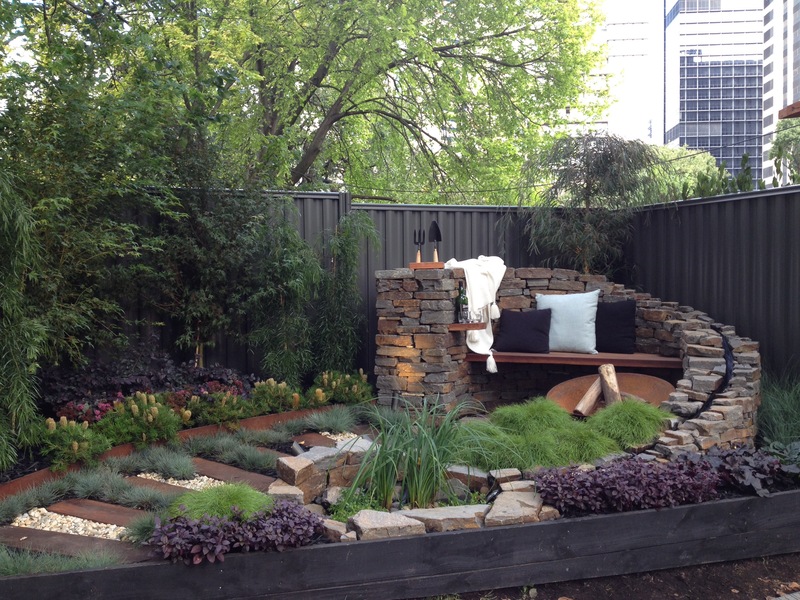 As I have mentioned in the previous blogpost, I have been to the Melbourne Flower and Garden Show recently and would like to share with you some of the great landscape design showcased there. Below is the Silver award winner for 2017. I love the beautiful water! 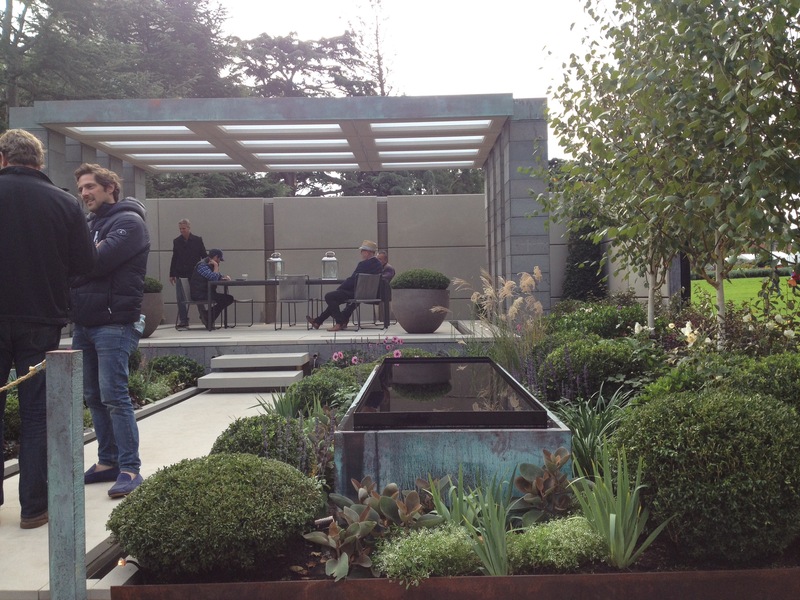 I love the pillow and the water feature below. And lastly, the Gold medal winner and the creator of this design himself! 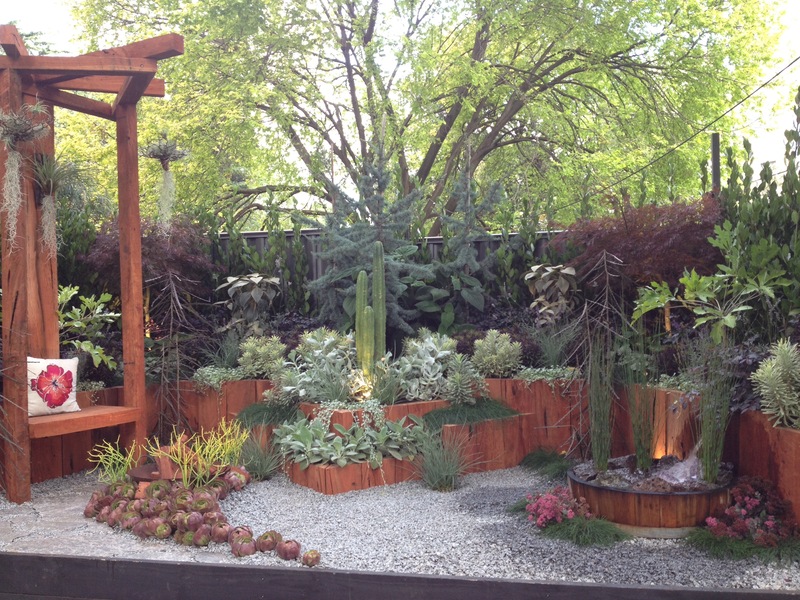 I hope you got inspired to try things in your own garden or backyard. 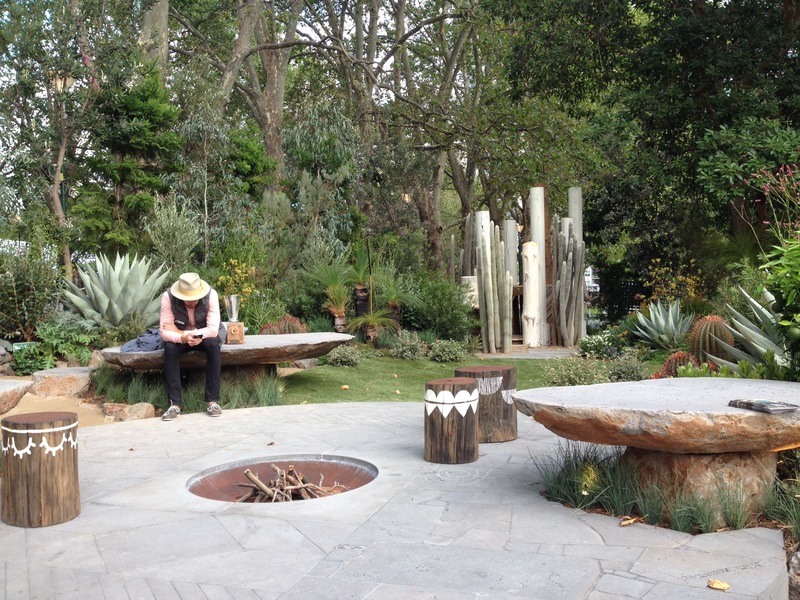 As someone who loves flowers and creates Artificial Flower Arrangements in Melbourne, Australia, I was very excited to visit the annual Melbourne International Flower and Garden Show on the weekend. This lovely event has been taking place since 1995 in early April each year. It is located in the World Heritage Site of Carlton Gardens and the Royal Exhibition Building. This building is absolutely stunning inside and out! 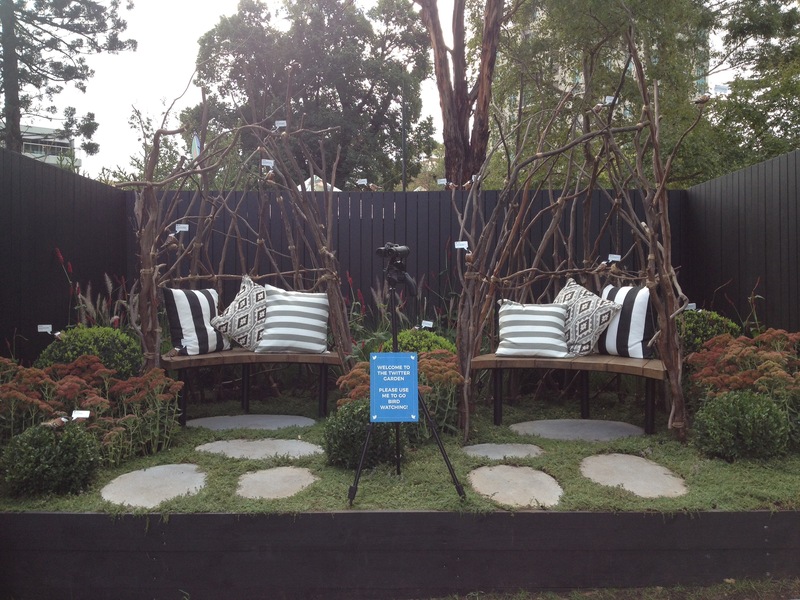 Carlton Gardens were transformed for this event. Everywhere you looked there was something interesting happening. There were lots of people rushing everywhere. You could find and buy everything you needed for gardening- flowers, bulbs, tools, decorations such water features, sculptures, furniture and more. This is me among the scultpures, which are a part of a competitions and can be purchased as well. 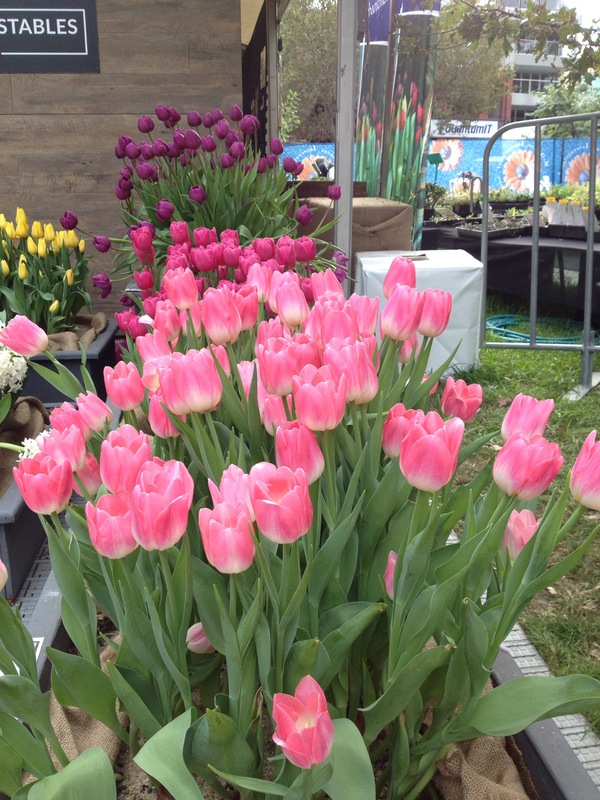 Most people bought fresh flowers or bulbs to plant at home. Some bought mini clay flowers, which looked very realistic! Inside the Royal Exhibition Building I was surrounded by the beautiful, surprising, unbelievable floral creations. Most people who exhibit are either professional florists or students from higher education institutions or floral societies. Everyone marveled and took pictures and selfies. This is me with the free blue bag, given to everyone by the newspaper brand-Herald Sun. This was one of the most elaborate floral creations involving lots of twigs and gorgeous anthuriums. Another amazing Heart creations was on the first floor of the building and it looked great there as part of a table set for a proposal with the ring in a box and champaigne! A lot of the fashion design students participated in the show and showcased an amazing level of creativity in dressing up their mannequins. The fashion design below is my favourite creation, it is so simple, the skirt is made using just leaves of palm trees and monsteria plant and the headwear is made of some twigs but the result is absolutely amazing! Notice the bodice and the bracelet! Wow! There was a lot of color and flowers of all kinds were showcased! Some creations were small while others were on the larger scale. Beautiful pink paper cranes were used in the design below to hang from the ceiling with flowers. The effect was magical. The show was a lovely opportunity for me to see so many people interested in flowers and to share some of the flyers of my own Artificial Flower creations with them. 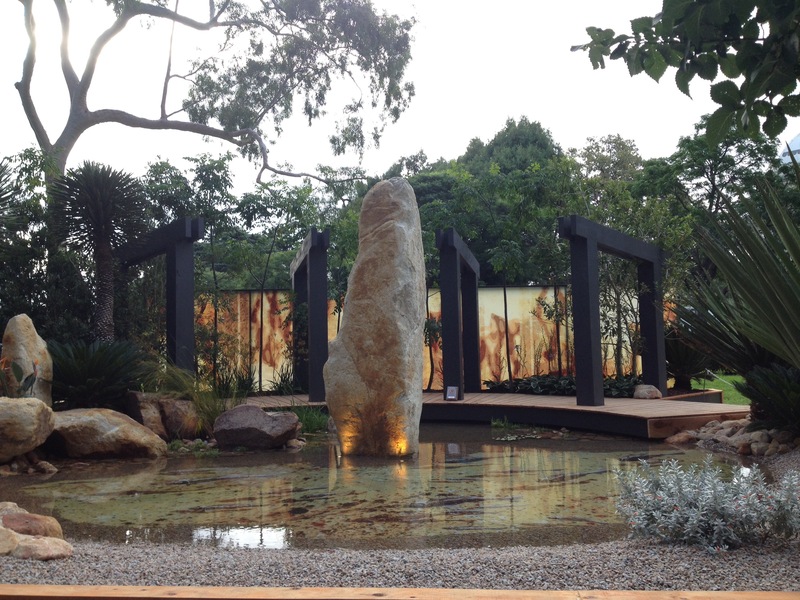 In the next post I will be sharing some of the sculpture and landscape design ideas from the Melbourne International Flower and Garden Show. I hope you have enjoyed this post. 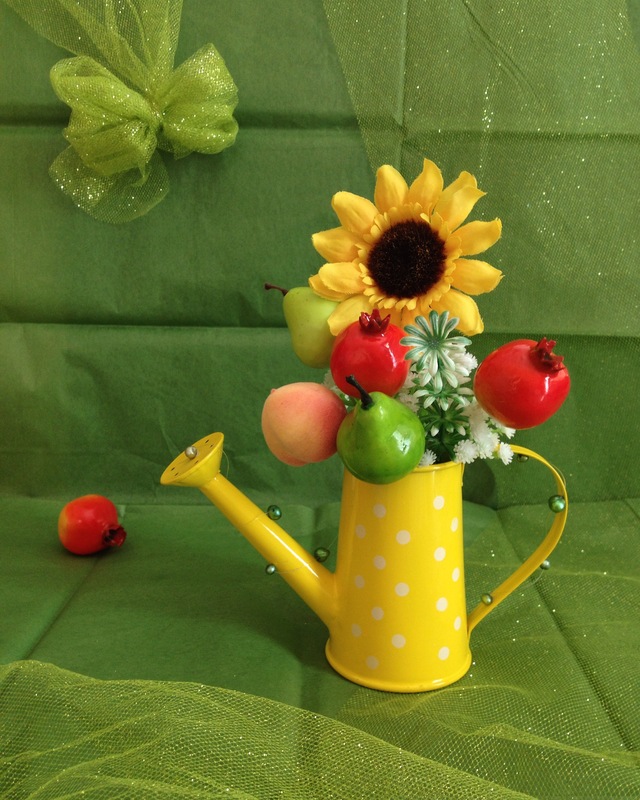 Mini still life with flowers and fruit. I have enjoying styling this photoshoot as well as creating the floral design. A heart full of love and flowers for the front door. Looks pretty welcoming! Spray painted some roses, which are artificial, of course. Will be using them in Valentine Day’s display. A floral arrangement for Chinese New Year. 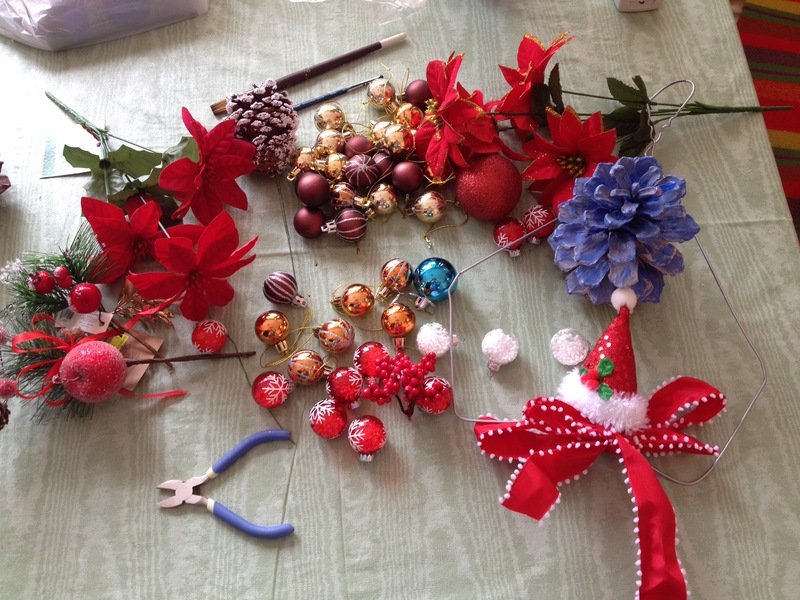 It was so much fun picking gorgeous flowers and foliage to create with. What if the flowers were outside of the vase? Why not? In the past year terrariums have been in style. 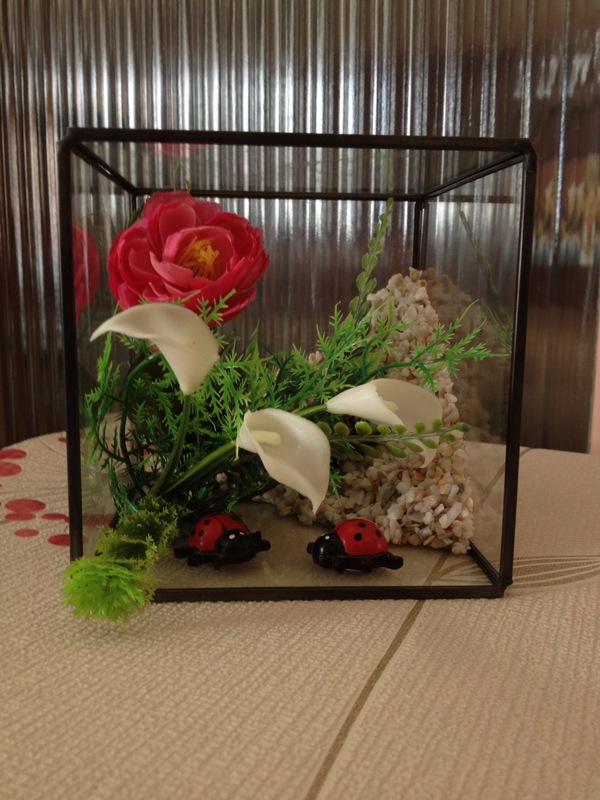 Mine has somi mini artificial flowers that will last forever and two gorgeous ladybugs / ladybirds. I found a photoframe at home and the idea to fill it with flowers came to me. This decor hangs in the living room window do all the people stop and look at it before getting into the house. I hope you have enjoyed my creations. I have an online shop where you can buy my various floral designs for yourself or someone who loves flowers. 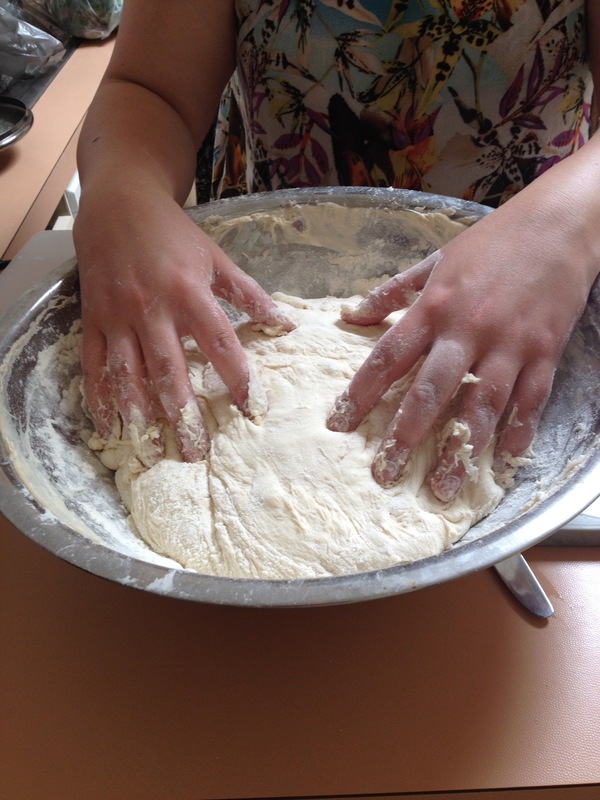 Today I made a chicken soup that my grandmother and mum always cooked since I can remember. 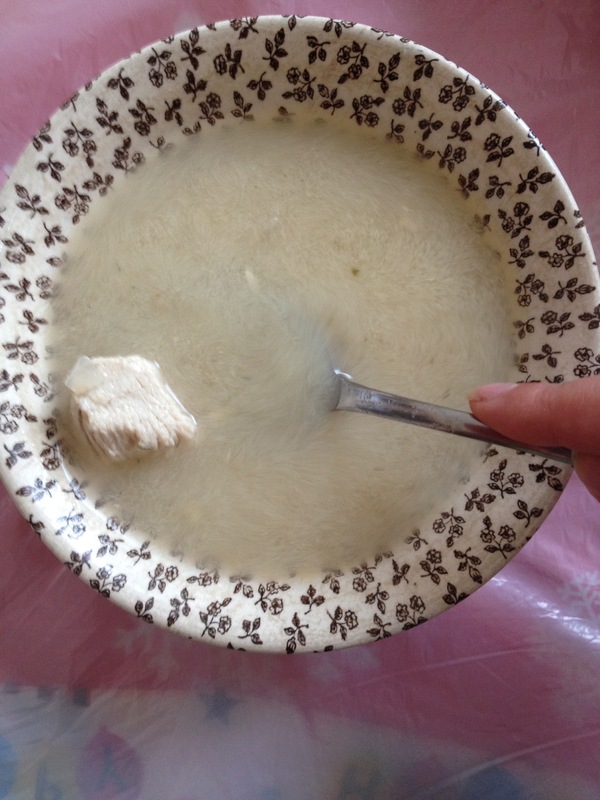 It is a delicious soup of Georgian origin. Here is how I made it. 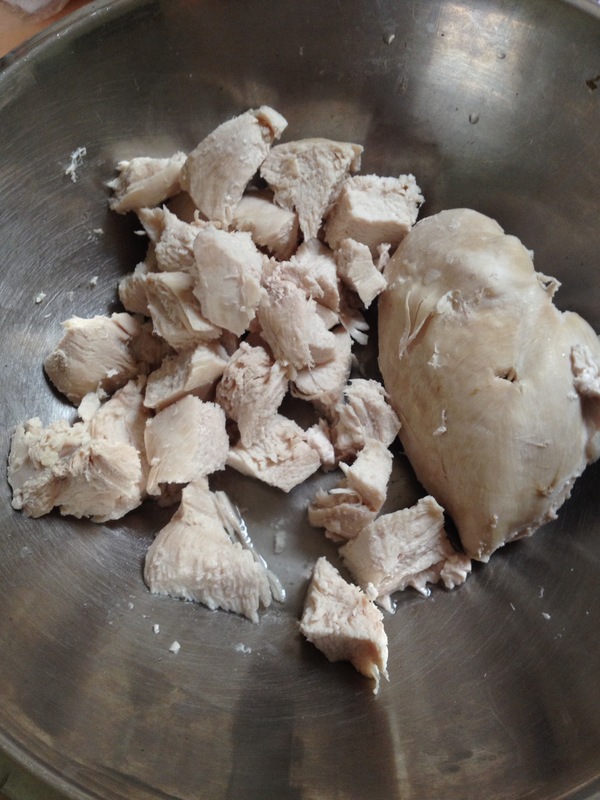 Bring chicken breast (3-4) to boil in water and cook until ready. Remove any impurities. Take chicken out and cut into pieces, set aside. Finely chop and fry in oil 3 medium onion until soft and golden. 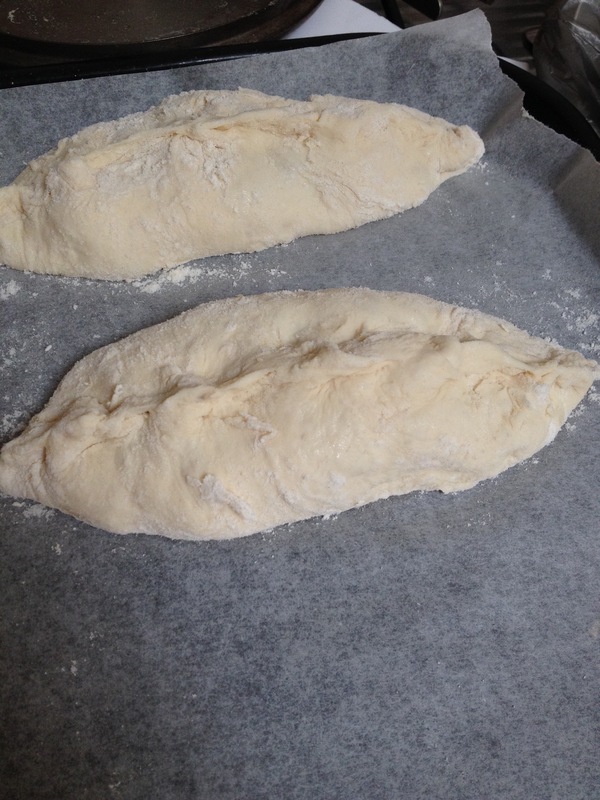 To that pan add 1 tablespoon on flour, stir and mix well. Add some chicken soup into the pan and disolve the onion and flour well. 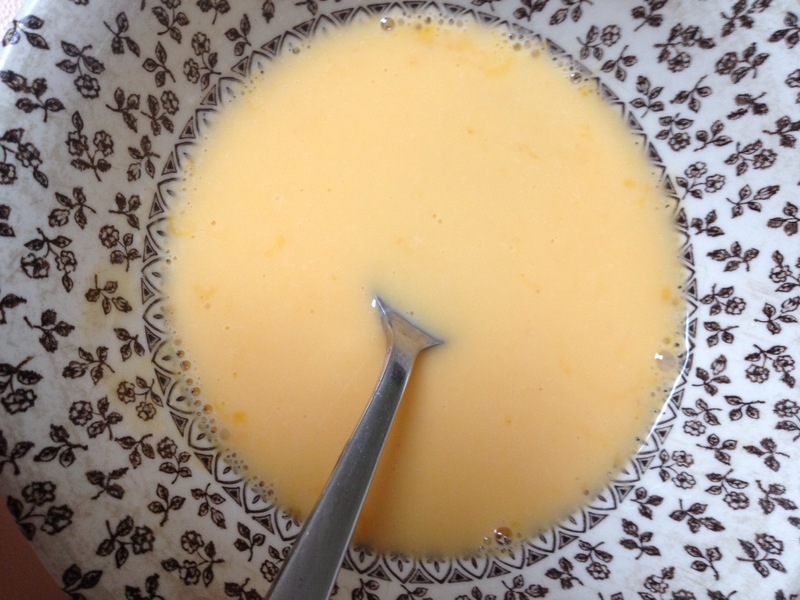 Pour this mixture into the soup. 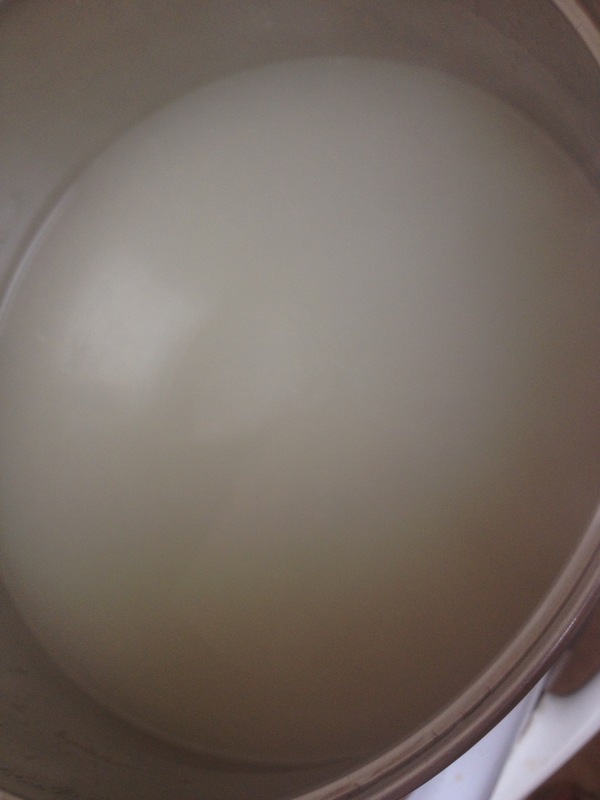 Bring to boil, add 2 tablespoons on white vinegar, salt, pepper. 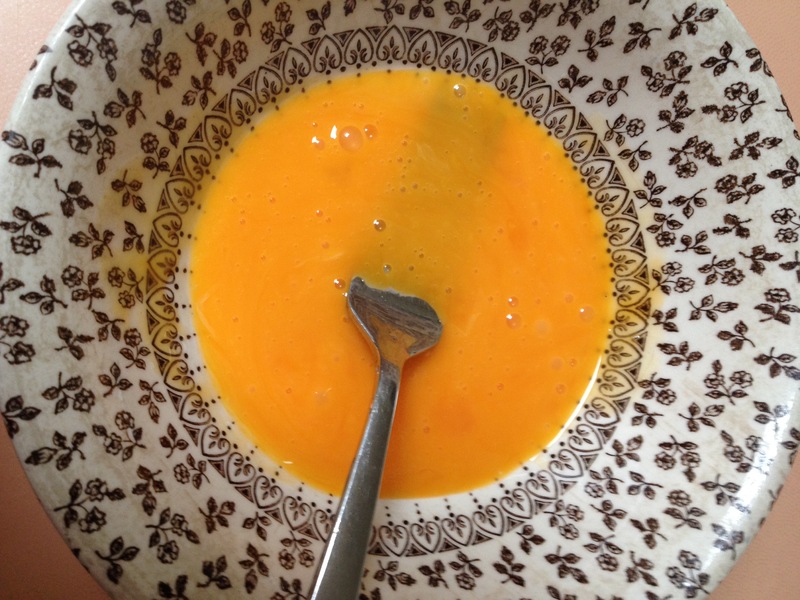 Obtain 2 egg yolks and beat them in a plate with a fork, add some chicken soup into that plate, mix well. Before serving the soup, pour the egg mixture into the pot, add back the chicken pieces, warm the soup but do not let it boil. Add any herbs you have and voila! This delicious soup tastes even better the next day! Season to taste, add more vinegar if the taste is mild. Make it today for your family! I absolutely love being creative with anything you can think of. 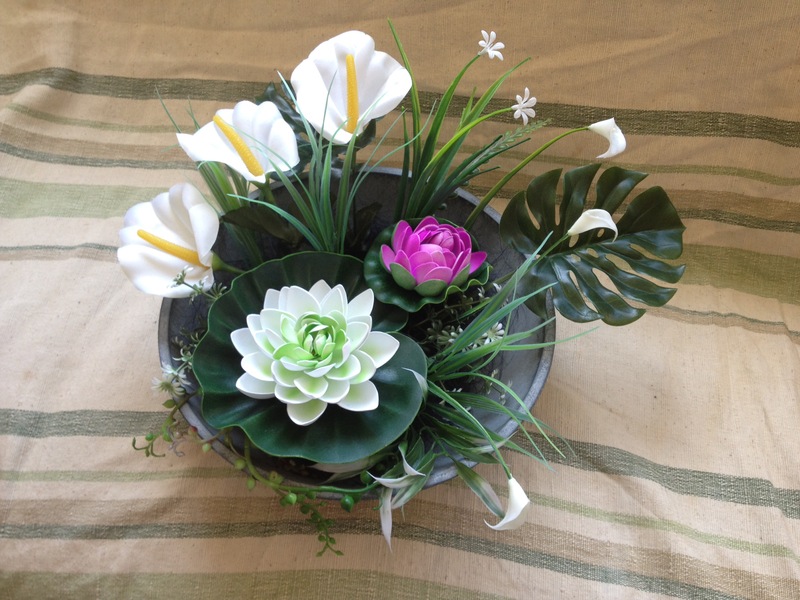 I am enjoying creating beautiful pieces with artificial flowers and foliage. 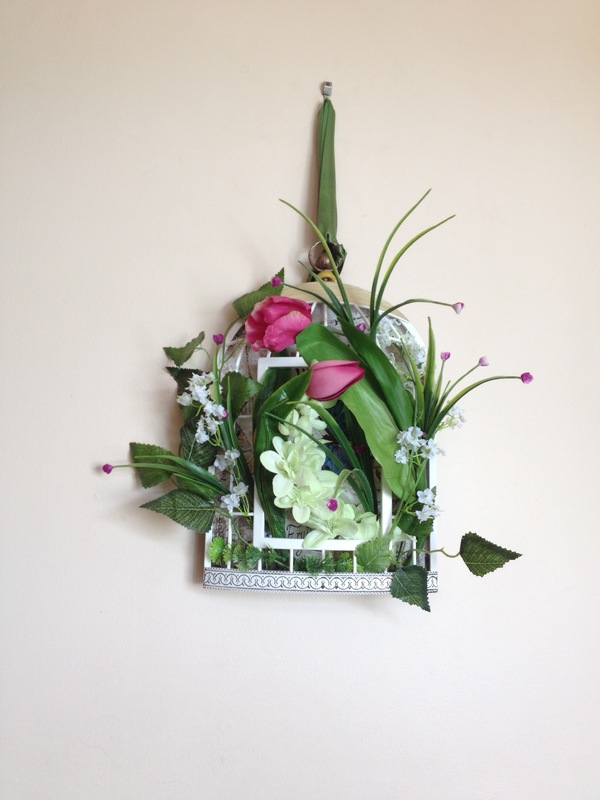 Having at home unused photo frame that looks like a cage gave me an idea to create a lovely floral design. It hangs now it the living room’s window and all the visitors to the house can see it before they come in! So simple, yet it looks very stylish and on trend as a home decor floral arrangement! 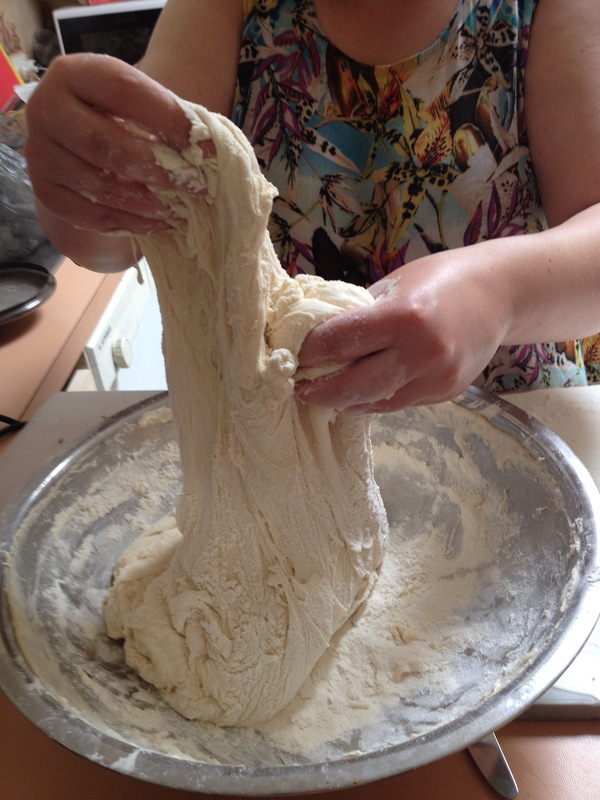 I have never made a yeast dough before, so it was surprising to me how easy it was to make! 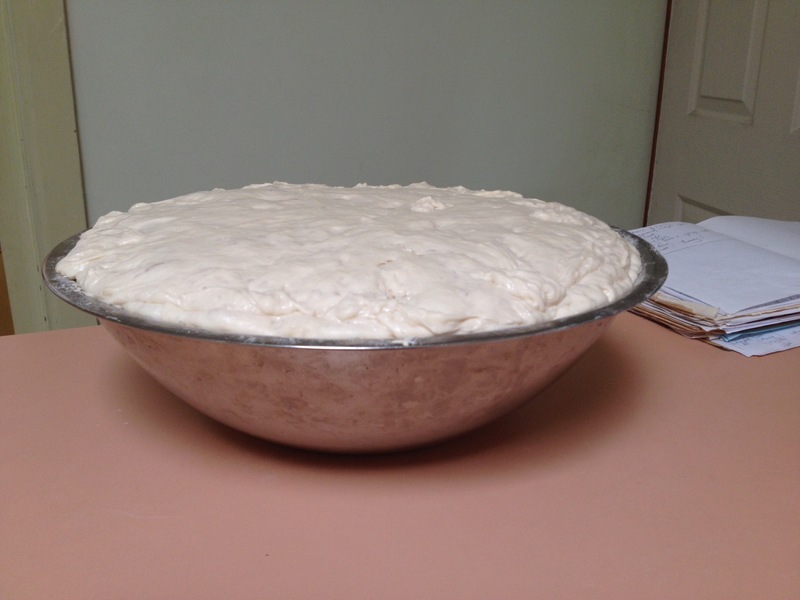 I made a starter with flour, warm water, dry yeast and sugar. Mixed everything well, covered with plastic wrap and let it rise for 4 hours. 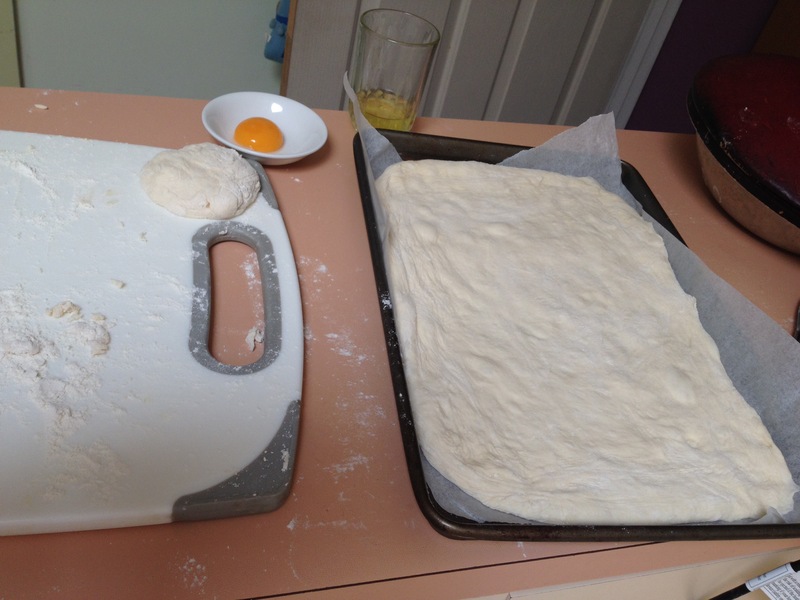 Then mixed again and let it rise for another 2 hours. 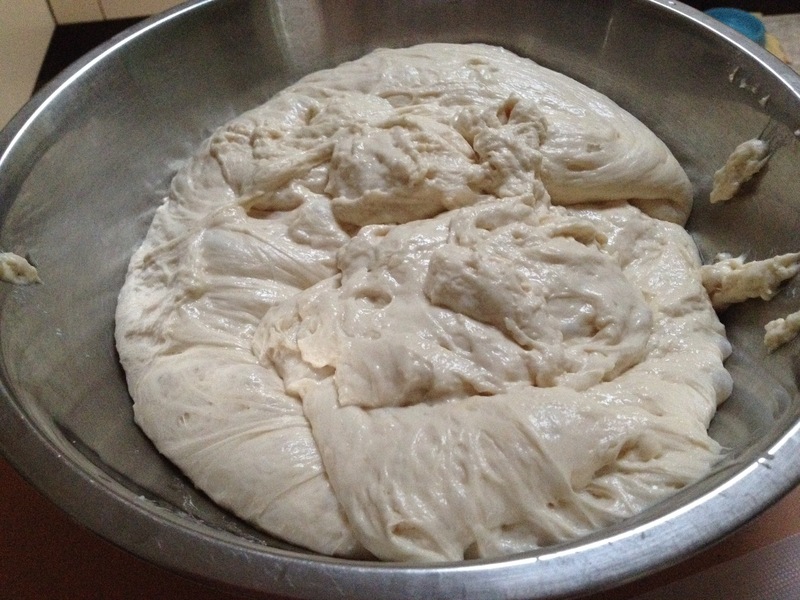 Then I added more flour, warm water and salt and mixed well, let it rise a few more times. 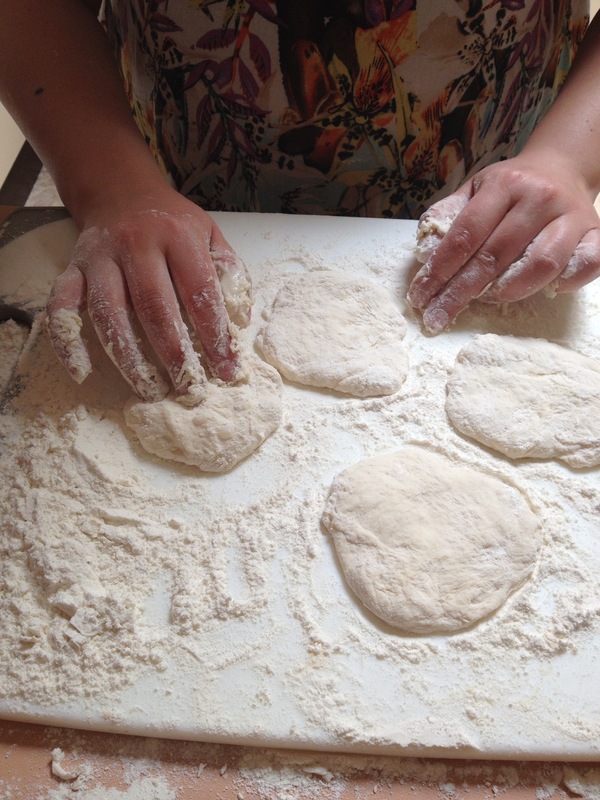 Since I made a lot of dough, I decided to bake a large meat pie and smaller pies, called Russian piroghki and bread. Well, I baked at 180 celcius in the oven for an hour. The result is amazing! The family loved everything! 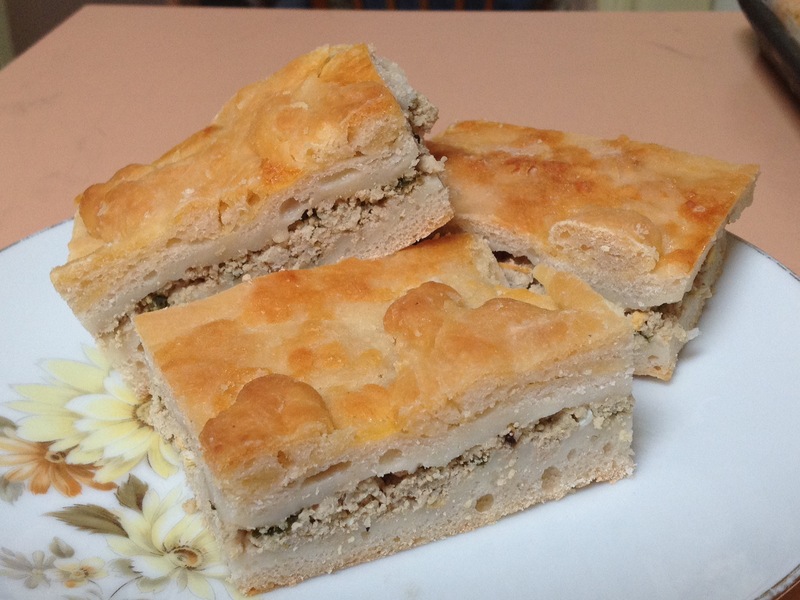 Thank you to youtube- “heghineh’s cooking” Armenian bread matnakash!!! Я люблю своими руками создавать красоту для дома. Вот придумала такое украшение, которое повесила на стену в столовой. Надеюсь Вам понравилось! Посмотрите мой Instagram- Zara_Creates. Всех с Наступающим! Xmas is coming! Recently I was invited to a friend’s home for a party. The host asked to bring along a plate of food. 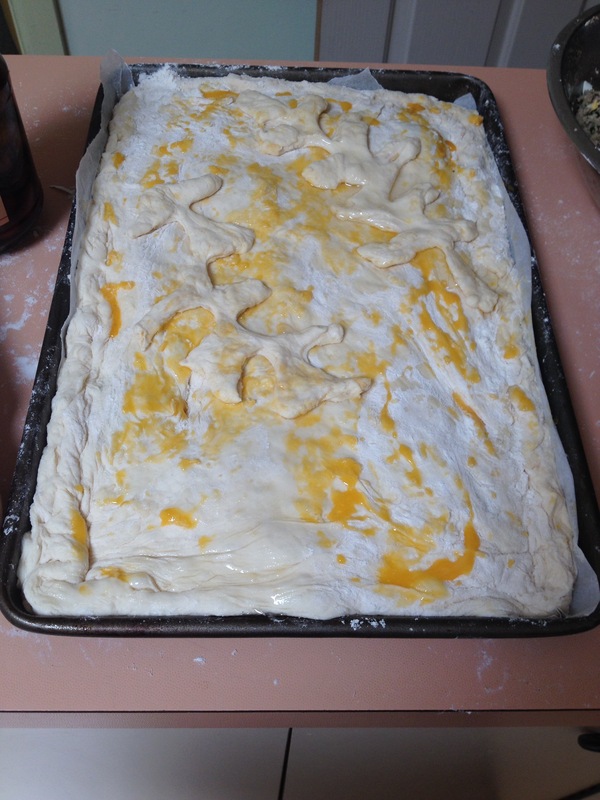 In the past I made some yummy meat pies from puff pastry but this time I wanted to share something Armenian with my Australian friends. 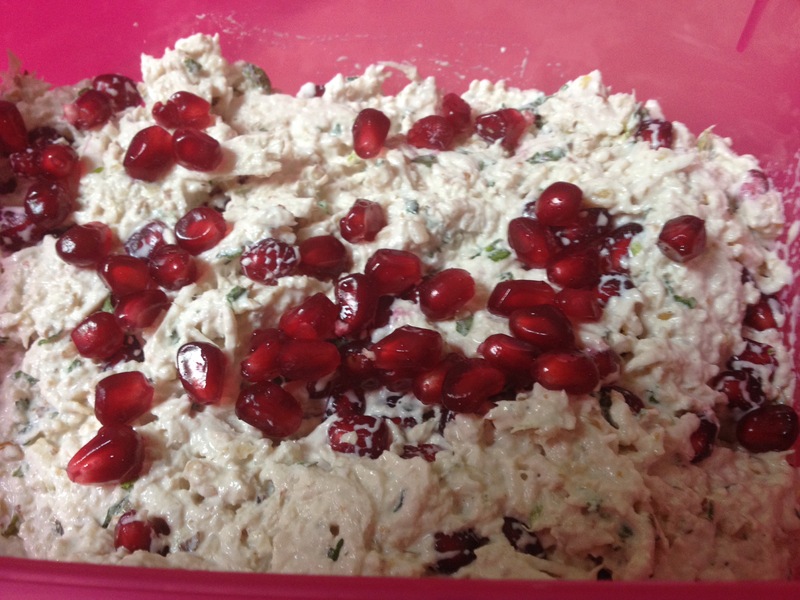 So I decided to make an Armenian chicken salad with walnuts and pomegranate seeds! Недавно меня пригласила в гости моя австралийская подруга и попросила принести что-нибудь вкусненькое с собой на тарелочке. Я решила приготовить очень легкий, полезный и вкуснейший армянский салат. Measurements below are approximate, so please add as much or as little and taste. У меня все на глаз, так что пробуйте и добавляйте ингридиенты по вкусу! 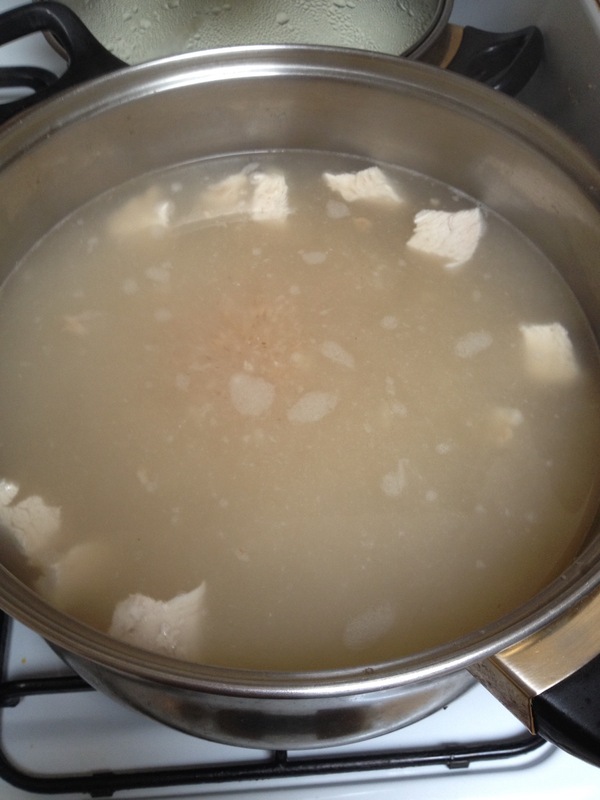 Cook chicken breast by boiling in water. 3-4 pieces might be enough. With a fork shred the chicken. 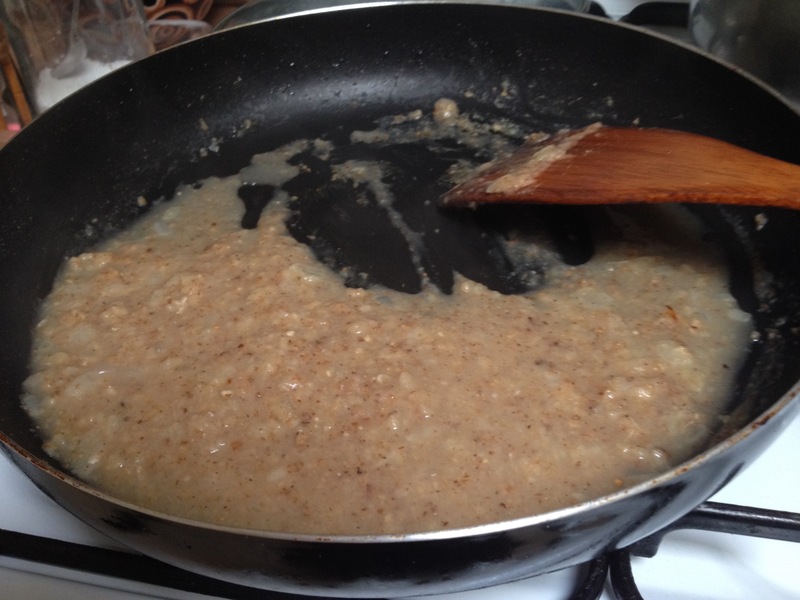 Chop walnuts (1 cup), crash 1-3 pieces of garlic / finely chop it. 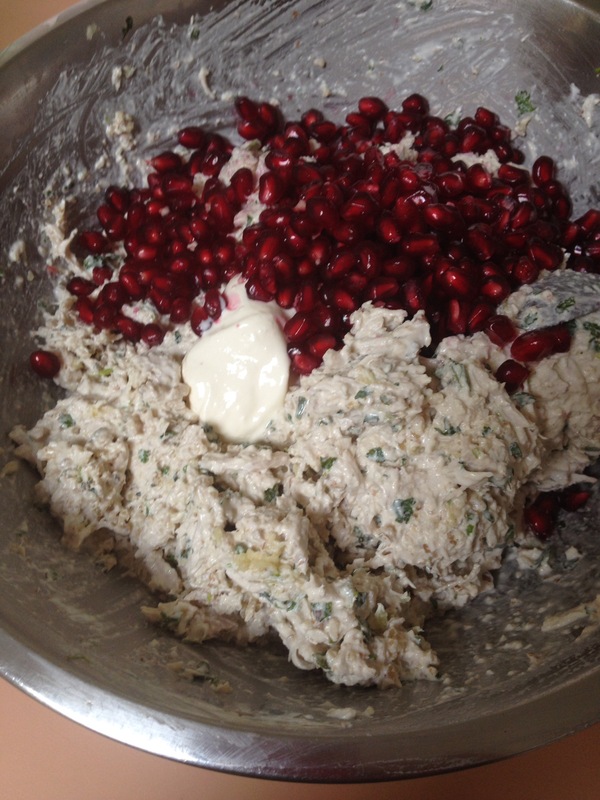 Mix everyting together in a bowl, add light sourcream and seeds of a ponegranate/s. 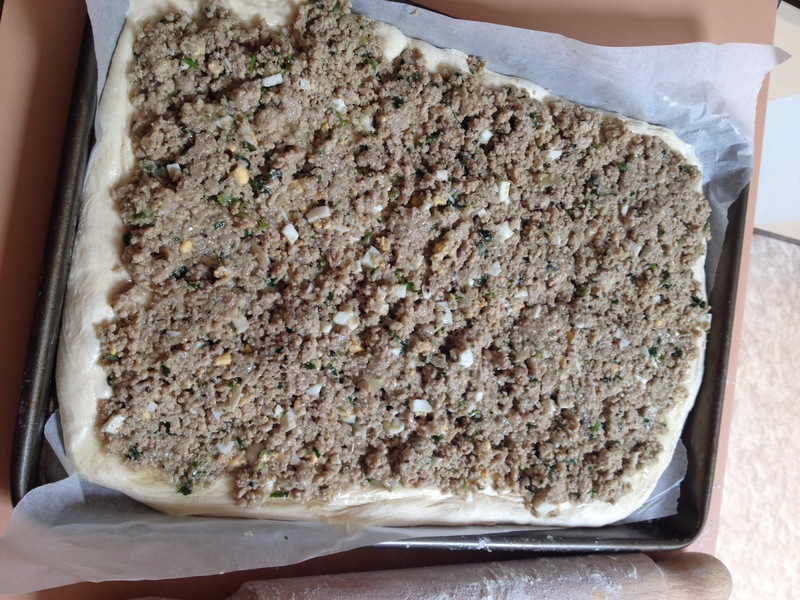 Add salt and pepper and any herbs if you like. That’s it! Отварите 3-4 грудки курицы в воде. Когда сварятся, вилкой раскрошите мясо. Мелко порубите грецкие орехи (1 стакан), чеснок 1-3 зубчика. Все это положите в миску, добавте сметану, зелень и зернышки граната, соль и перей. Все перемешайте и кушайте на здоровье! 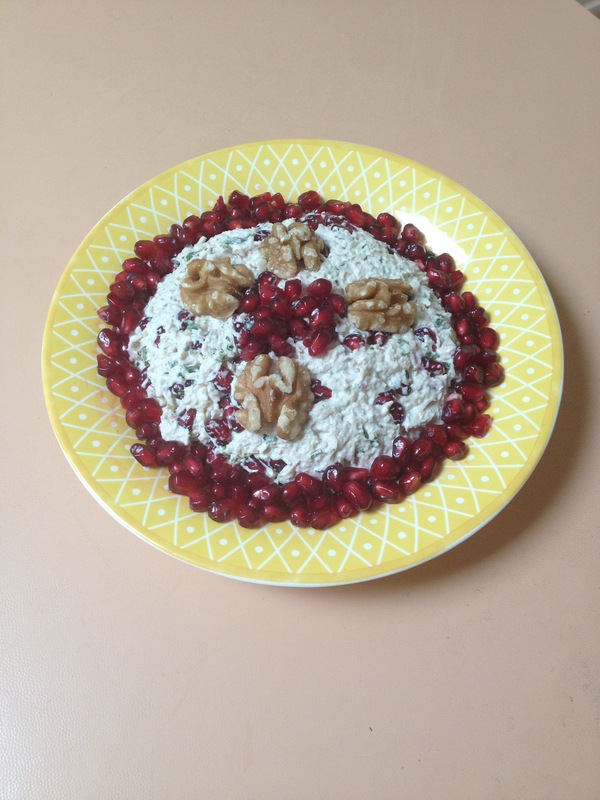 Plate up and decorate the delicious salad with walnuts and pomegranate seeds. Украсить салат можно гранатом и орехами.